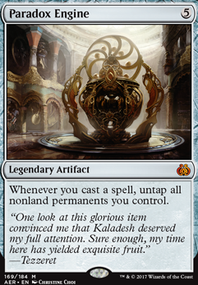 Isochron Scepter + a cantrip, Paradox Engine... Draw your whole deck. Aetherflux or Aurelia’s Fury for victory! They are pretty fun and pretty powerful. Once you get Magnetic Theft off of your first Sunforger activation, Feather will keep returning Magnetic Theft to your hand. Now Sunforger only costs WRR to activate each turn. Remember, Magnetic Theft is an instant, so you can do this during each of your opponent's turns. Torchling effectively gives all of your targeted removal spells buyback for just one R mana. Here's how it works! Target your Torchling with a spell like Swords to Plowshares . Change the target of the spell to a creature you want to become targeted. Lets say you want to exile your opponent's commander. The spell resolves, it goes back to your hand, and your opponent's commander is exiled.